A wide view of the temporary General Assembly. Action in the Assembly follows months of ratcheting tensions in Ukraine triggered by the Government's decision last November not to sign an agreement on broader European integration. The capital, Kiev, erupted in violent demonstrations and street clashes in late January, culminating in the removal by Parliament of President Viktor Yanukovych. Tensions continued to mount in the Crimea region, where Russian troops and armoured vehicles were deployed in February and a secession referendum was later held, in which, according to the UN, Crimean authorities announced that close to 97 per cent of those who voted did so in favour of the region joining Russia. Subsequently, Crimea declared its independence, which in turn was recognized by Russia. In the immediate aftermath of those events, President Vladimir Putin signed a treaty to make Crimea part of Russia, while the Government in Kiev committed to never accept Crimea’s independence or annexation. Throughout, the UN has continued to press for a diplomatic solution to the crisis, with Secretary-General Ban Ki-moon, Deputy Secretary-General Jan Eliasson and other senior officials having visited the region, including Moscow and Crimea, over the past three weeks. 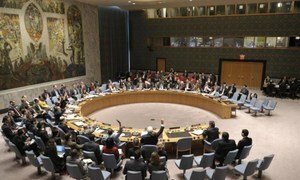 The UN Security Council convened seven sessions on the situation in Ukraine, and at its eighth meeting, Russia, one of the 15-nation body’s permanent members, blocked action by voting against a draft resolution that would have urged countries not to recognize the results of the referendum in Crimea. Finally, the Assembly resolution makes explicit reference to the primacy of the UN Charter’s call for the preservation of the unity and territorial integrity of all UN Member States, and also recalls the 1994 Memorandum on Security Assurances in Connection with Ukraine’s Accession to the Treaty on the Non-Proliferation of Nuclear Weapons, the 1997 Treaty on Friendship, Cooperation and Partnership between Ukraine and Russian, and other bilateral agreements between Ukraine and Russia.